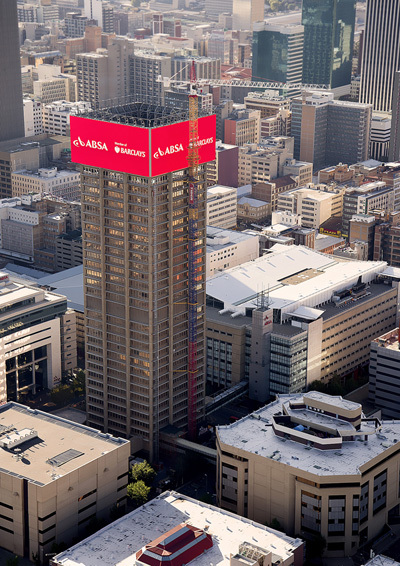 Johannesburg, April 2013 – Questek Advanced Technologies recently completed the configuration and integration of the 2 650sqm LED display that clads the top of the 29-storey ABSA Towers in downtown Johannesburg. Featuring 20 million LEDS, this iconic branding and marketing tool is being billed by the supplier and manufacturer, Barco, as the world’s biggest commercial visual display system. . The ABSA Lumen screen was designed by US based Herring Media for the Barclays / Absa group. Installation of the screen commenced in October 2012.and was completed in a record four monthperiod Once installed, Questek handled the configuration and integration of the 2 880 TF-20 tiles that make up the screen ensuring that the unit is run, controlled and monitored as one single image by one single operator. The complete system can be monitored and controlled from anywhere in the world where there is internet access due to the intelligence of the Barco controller. The four sides of the LED display that wrap around the building form a live canvas that allows video and images to move seamlessly from side to side. The media displayed on the large screens is generated from four Coolux media servers which provide seamless video content on a timeline that is remotely uploaded and controlled. ‘We also installed Barco screens for the 2010 FIFA World Cup at Royal Bafokeng, Green Point and Orlando Stadiums and various outdoor advertising screens in the Sandton area. The Absa Lumen screen is now not only a local landmark, but makes South Africa a global reference site.’ concludes Van Gils.